At last! Gaiter that isn’t baggy, wont ride up off your shoes, and has an adjustable and replaceable strap. Ultra strong but stretchy Kill Twill Cordura for fit, breathability, and durability. Ordered these online after looking at about 7 different brands and emailing UD about the sizing of these gaiters. Couldn't be more happy, used them today on my 50K training run and not one spec of dirt or rock or mud or sticks or whatever went into my shoe. I wear a 9 US mens, I was advised size small, I could probably of used a medium and made it work but I think I would of ran the risk of it not being able to get tight enough around my leg just above my ankle. I trail run in La Sportiva Ultra Raptor shoes and there is a small arch in the shoes that is great for the strap that goes under the shoe to keep it down. 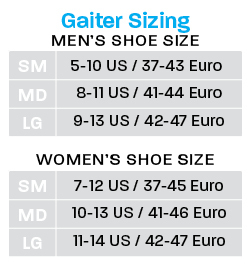 What size to get to compare to the shoe size. Like I where a size 7 womens?